Our starter websites are ideal for start-ups or those on a tight budget and provide a quick and easy way to get a site up and running. You could have a website up and running in just a few days by selecting a pre-defined template to form the basis of your new site. Once you’ve selected from our range of templates we’ll customise it to include your brand colours, logo, and imagery ensuring it remains bespoke to your organisation. Below you’ll find our range of starter templates available for selection. Click ‘Read More’ to view more about the template and to view examples of it in different colour schemes. Want that little bit extra? Our templates come pre-packaged with a number of features including content pages, banners, carousels and more. However, we also offer additional add-ons that can be added to your site to enhance it with extra functionality. See below for a list of these add-ons available and view an estimated running total at the bottom. If you don’t see a feature listed that you’d like to include please get in touch and we’ll see what we can do to help. A homepage containing a banner slideshow, carousel and overview of your services and/or products. Five standard pages containing content about your business and services offered. A 'Contact Us' page containing an enquiry form and your contact details. Integration into a CMS (Content Management System) giving you full control over the content on your site. List and sell your products online by adding an online store to your website. Need help writing the content for your website? 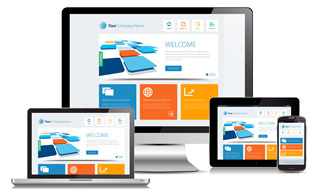 We can write the content and insert into your website. Looking to go social? We can set you up on all of the major social sites including Facebook, Twitter and more. Display a real-time stream of your Twitter activity, branded to fit seamlessly within your website. We can set you up a Google Analytics account and schedule regular reports be emailed to you containing statistics about the visitors to your website. Now that you’ve selected your template and picked any additional features you require, the only thing remaining is to get in touch so we can discuss the finer details and obtain what we require to get started (your logo, branding colours etc).